Brainiac 5, Triplicate Girl, Saturn Girl, Bouncing Boy, Phantom Girl and Lightning Lad are commenting on what they thought of Superman. "Lost," "Nice," "Rawr!" and "Geek-A-Zoid" are the collective thoughts. Not much of an impression for the man who inspired the modern age of heroes - not to mention the future age! Each of the core membership offer their opinion on Clark. Lightning Lad, is the Legion Field Leader and just can't see Clark ever fitting in while he is still a loser. He introduces the team to the young Kansas farm boy. Garth Ranzz - Lightning Lad, with the power over electricity. Tinya Wazzo - Phantom Girl, with the ability to make herself intangible. Luornu Durgo - Triplicate Girl, with the skill to split into three clones. Chuck Taine - Bouncing Boy, able to inflate and bounce like a rubber ball. 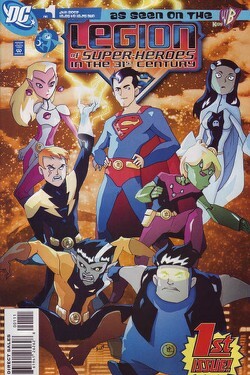 Querl Dox, Brianiac 5, a supercomputer being possibly a descendant of one of Superman's deadliest enemies. With all those special skills on hand Garth smirks that Clark is a nerdy wimp. Clark is just beginning to be a Super Man and offers to test his limits on the Legion test equipment. Lightning Lad pushes Clark harder and harder till Clark is broken in spirit. Brainiac 5 is angry with his teammate and the fact he has given Clark details of his own future. Brainy tells us the plan was originally to recruit Superman during his years in Metropolis, but even with his 12th level intellect somehow they ended up in Smallville, he's 99.9909% sure he programmed it correctly - could something else have influenced their arrival in Kansas? He retells us how they arrived during a Fair and watched as Clark stopped a ferris wheel from toppling. They offer Superman membership and Clark finding other superhumans gladly accepts, joyous that he isn't alone. Ready to fight for truth and justice! WAIT! Saturn Girl interrupts, telling us that Brainiiac 5 is mistaken in his recollection. Clark was torn, confused, uncertain and only cautiously went with them. He wasn't ready to be Superman overnight but did so to help his new friends from sworn enemies of the Legion - the Fatal Five! Bouncing Boy recalls his eagerness in battle, while Lightning Lad recalls his clumsiness. Superman won the battle but only because he had Garth to train him teaching him about his special powers before he knew they existed! Ultimately it was his success in battle that convinced the Legion to allow him full membership! Even though they all had their own viewpoint how Superman eventually joined them. Despite their differences they are still friends, still a team - Long Live The Legion! Story (prior to watching the episode) - 1: A poor attempt to tell a non-story where nothing happens. The transitions don't work well - are they talking to us or to each other? Not good to rely on people watching the series to enjoy the book. Story (after watching the episode) - 4: All the moans above turn into positives. It translates the episode well through the personalities of the team. They carry it and its only them that lift it (but only with the back up of the actual episode to add depth). It was fun to read, however if you hadn't seen the show already this would grab you as an awful issue of nothingness and choppy. Perhaps it would put you off the comic AND the show. BUT as a first issue I'll cut it some slack. Make sure you cater to non-viewers though DC as the episode was leaps and bounds better. Art - 4: Character models are pretty close to the show, nice pencils and good coloring. Inks however seem a little on the heavy side. Cover Art - 3: I ummed and ahhed over this cover - it looks great (though the advert version inside looks better in the blue hue.) It's a little too manga inspired than the show but acceptable fare. Scored high due to composition mainly.